Asthma is a chronic lung disease that is considered one of the most common long-term diseases among children; however, adults can have asthma too. Currently, we do not know how to cure it; however, if someone in your family has asthma, it’s more likely you will have it as well. Asthma is marked by recurring episodes of airway obstruction caused by exposure to “asthma triggers” which results in inflammation of the airways where the muscles surrounding the airways become tight and the lining of the air passages swell. This can lead to labored breathing, wheezing sounds, coughing, and chest tightness. Other symptoms may be present; however, most people with asthma have wheezing attacks separated by symptom-free periods. It is deadly! Approximately nine people die from asthma each day. 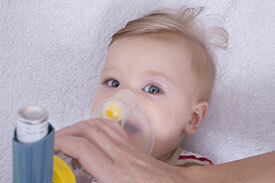 In the last decade the number of people with Asthma in the United States has risen by 15 percent. In adults, women are more likely to have asthma than men. 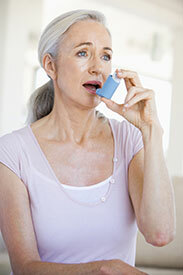 Asthma attacks can last minutes to days and can become dangerous if the airflow becomes severely restricted. In sensitive individuals, asthma symptoms can be triggered by breathing in allergy-causing substances. Triggers include pet dander, dust mites, cockroach allergens, molds and pollens. Asthma symptoms can also be triggered by respiratory infections, exercise, cold air, tobacco smoke and other pollutants, stress, food or drug allergies. Aspirin and other non-steroidal anti-inflammatory medications (NSAIDS) can provoke asthma in some patients. For more information, contact the department's Asthma Prevention and Control program, at (573) 522-2876.